After being killed and partially devoured by walkers, the Savior Justin (played by Zack McGowan) rises as a walker. 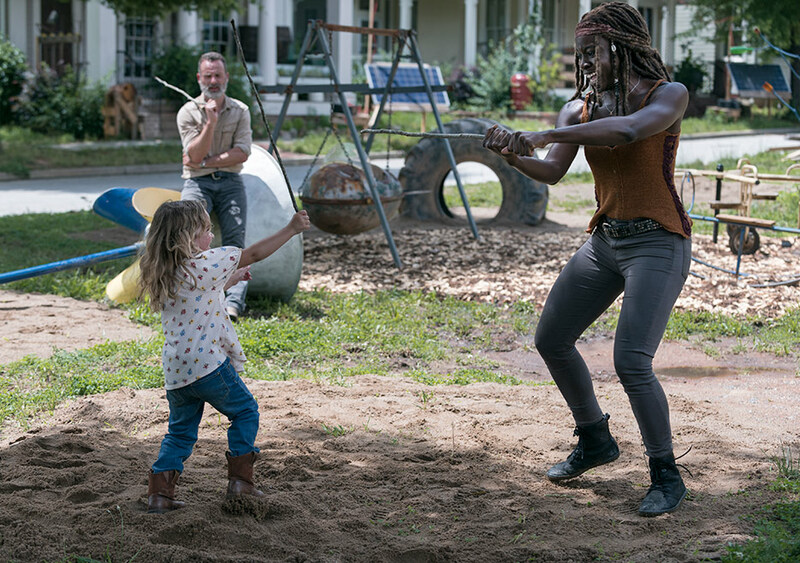 Rick (played by Andrew Lincoln) and Michonne (played by Danai Gurira) enjoy a peaceful day in Alexandria with baby Judith while expressing hope for the future of the communities. Maggie (played by Lauren Cohan) is on her delivering food to the bridge when she’s accosted by Saviors looking for Justin and the other missing Saviors. While everyone is less than friendly the encounter doesn’t escalate to violence. At the bridge the Saviors demand guns after learning of Justin’s murder but Daryl (played by Norman Reedus) and Maggie (played by Melissa McBride) refuse, they begin to riot but Rick diffuses the situation before it escalates. Rick talks to Daryl because people think he did it but doesn’t believe that but Daryl reminds Rick that many people in all the communities have reason to kill the Saviors. While patrolling Maggie and Cyndie (played by Sydney Park) find walkers drawn to a house with a loose metal beam. They’re attacked by walkers boarded up inside when they go to stop it but kill them with help from Rick and Daryl. However when others who were supposed to arrive don’t they find a member of Oceanside knocked out and Arat (played by Elizabeth Ludlow) another Savior missing. All these scenes of Rick’s happy life are so gratuitous because we know he’ll be leaving the show (likely die) so it’s like they’re getting every last bit of Rick they can get. Also all of these walker attacks ending with last minute saves by the cavalry is too repetitive; come on they can’t arrive in the nick of time every single time. The Savior murder mystery is a fun storyline, watching Rick use his police skills it’s like a Walking Dead version of Law and Order. It’s providing all the right amounts of intrigue and drama which makes the story work because most of these Saviors we don’t know. Arat is somewhat recognizable as a former lieutenant so it makes sense she’s the one who is captured/killed next. Given how many people have a motive for killing Saviors it might start a chain reaction and ignite a second war. Rick’s bright future is getting darker by the minute but if it all goes to hell he won’t be around to see it. The Saviors don’t know about Arat and the group hold a meeting about what to do if they find out who’s behind the killings. They search for Arat but Carol thinks they’ll have to be prepared to fight if she’s dead because the Saviors will be ready to riot. Maggie and Daryl discuss how they can’t let go of their anger towards the Saviors despite Rick’s plans for the future, they find a body with an arrow in it and Daryl says he knows who took Arat. Jadis/Anne (played by Pollyanna McIntosh) returns to her junkyard (and former home) after being treated as a suspect in the killings. She takes a walkie from a box and radios a man from a helicopter she saw the night before. Anne has made a deal with them for an ‘A’ or a ‘B’ but she’s discovered by Gabriel (played by Seth Gilliam). She traded people in exchange for supplies for her former people, because people see her as a suspect she want to leave and asks Gabriel to come with her. Gabriel declines and says he has to tell Rick; Anne says she thought he was a ‘B’ and knocks him out. Someone’s up to no good. There was no decision made about punishing the person(s) responsible but so far the choices have been death or imprisonment. Likely they would be locked up because that’s how Rick wants to do things now but also most of these people wouldn’t be too mad at the person(s) killing Saviors. Daryl figured out who dunnit but a new mystery surrounding Jadis/Anne is taking it’s place. Anne talked a lot about not feeling trusted and used that as an excuse but clearly she’s been dealing with these mystery people for a long time; it seems nobody wants to follow Rick’s dream. Anne did seem to genuinely like Gabriel but not enough to abandon whatever these people have promised her. All we know for sure is people are labeled ‘A’ or ‘B’ and given how she treated Gabriel you do not want to be a ‘B’ person. 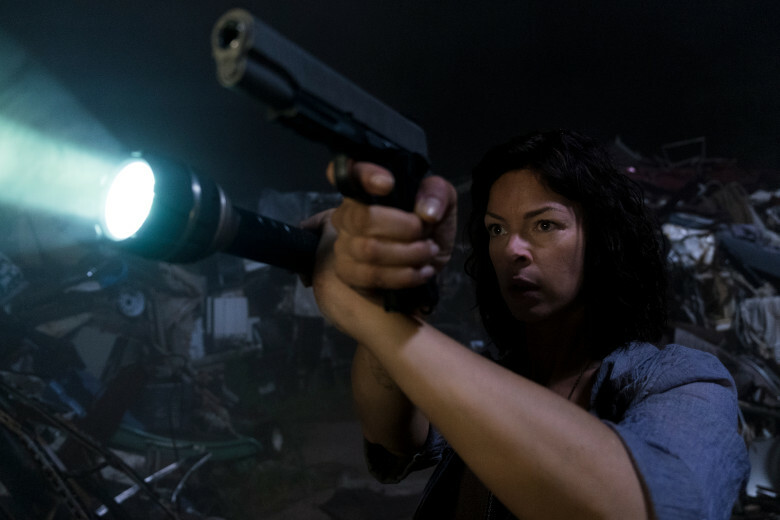 Rick and Maggie are attacked by two Saviors who try to take their guns, they disarm the men but take them back instead of shoot them. Maggie and Daryl find other Cyndie and other Oceanside women prepared to execute Arat as revenge for losing their former home and all the people they killed. Cyndie cites Maggie’s murder of Gregory (played by Xander Berkley) as their reasoning and claim Arat is their last target. When Maggie and Daryl learn what Arat did (including murdering Cyndie’s brother at that very spot) they leave and allow her to be killed and the next day the remaining Saviors leave the bridge project. Maggie says they gave Rick’s way a chance and that it’s time for her and Daryl to see Negan (played by Jeffrey Dean Morgan). The juxtaposition between how Rick and Carol showed mercy and Maggie and Daryl let Arat be executed was great. Arat may have changed but when you hear all of her crimes it’s clear some things can’t be forgiven. When Maggie learns Cyndie was inspired by her example you see something wake up in her. Maggie finally decided she’s had enough with Rick’s way and that it’s time to try her way. Maggie and Daryl have disagreed with Rick before but always stood with him now that they’re on opposing sides it’ll be interesting to see how that plays out. Does anyone really believe Cyndie and the others are just going to stop killing Saviors? Given Maggie’s rage I doubt Negan will get a simple hanging; she’s gonna make it hurt.